Should furniture be sanded before painting with chalk paint? This is the one question I get asked most often and my answer is, that it depends. 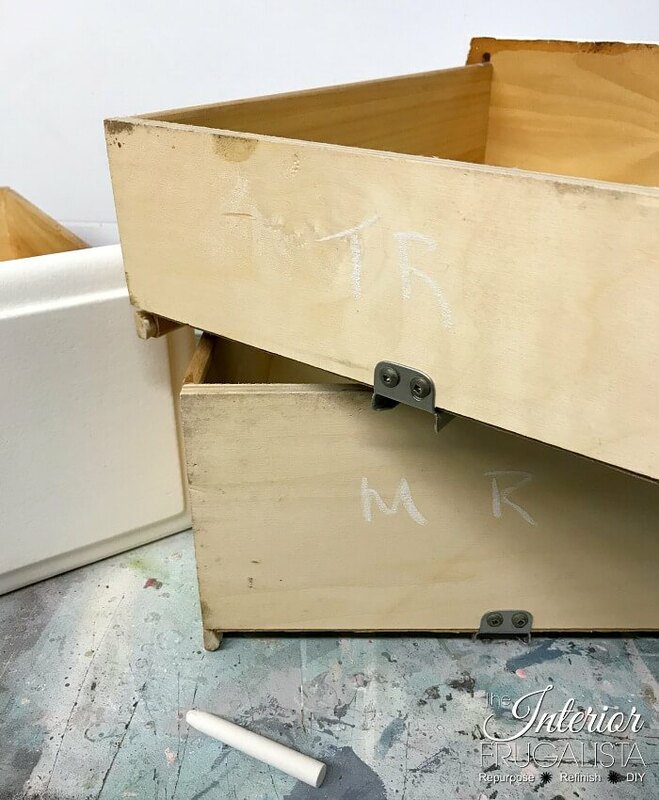 While many chalk paint brands say their paint doesn't require sanding, I always err on the side of caution, especially considering I sell my painted pieces. 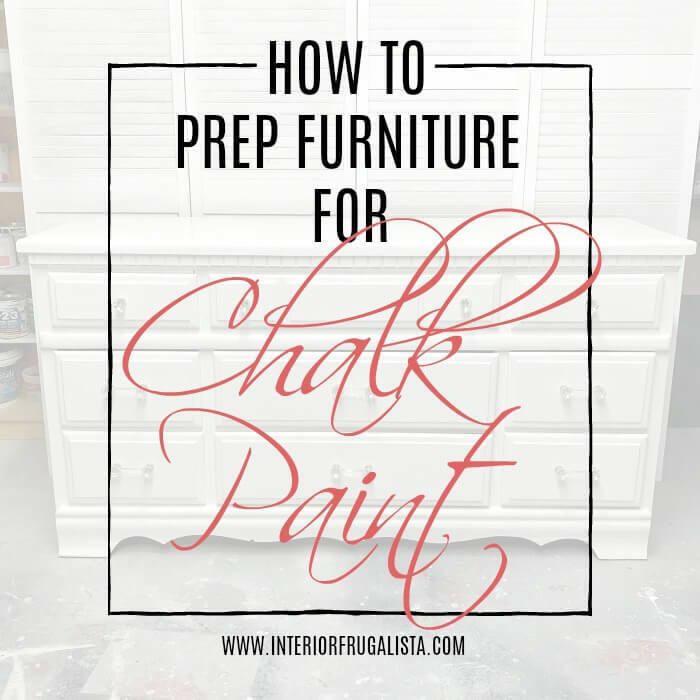 But there are some instances where I absolutely won't sand and so here I'm sharing tips on how to prep furniture for chalk paint from A to Z.
I hope you find this tutorial helpful whether you're about to paint your first piece or have a few painted pieces under your belt. You ALWAYS want to have a good bond with the paint. If you've been following the blog for a bit you know that I have a workshop in the basement of our home. I also live in a cold winter climate and so good ventilation is always a problem. For these reasons, I use low to no VOC (volatile organic compound) products. Affiliate links are included so you can see what products I use or recommend for prepping furniture. See my disclosure policy. Unless you know where it came from, you're going to want to give it a good scrub. Vacuum all the cobwebs inside, underneath, and on the back. My preference for cleaning furniture is one gallon of warm water with a drop of dawn dish soap and 1/2 cup of white vinegar. Wipe down all the surfaces with a damp rag. Some people prefer to keep the doors and drawers in place when painting furniture. Unless the piece is really old and there is a chance of not getting the hardware lined up again, I always remove them. Label the back of each drawer with chalk so you know which belongs where (ask me how I know about this important this step). Unless you plan on painting the original hardware (which I've been known to do on occasion), remove the knobs, pulls, and door hardware. Place them and the screws in a tub or tray so they don't get lost. Raise the furniture from the ground before painting so it's easier to paint along the bottom. My preference is these 3-wheel furniture dollies so the furniture can be moved around if need be. Placing it on top of paint cans or blocks of wood also works fine too. If you suffer from back or knee pain like I do, a hydraulic rolling mechanic stool will be your best friend. Raise and lower it as needed and scoot around the furniture as you work. Note: you want one with a short stem that doesn't restrict how low you can go. No more constantly getting up and down or kneeling on a hard floor. Fill any holes, deep scratches, and dents with wood filler. My preference is this non-shrinking filler compound. You suspect it may have been painted with lead paint. Painted pieces from the late 70's and back are more likely to contain lead. There are lead test kits available should you want to test first. I personally err on the side of caution unless I'm 100% certain. It has a smooth Arborite or high gloss enamel finish. The wood is cherry or mahogany. Sanding will open the grain and cause the tannins in the wood to bleed through the paint. For smooth Arborite or high gloss enamel surfaces, prime first before applying paint with either a brush or foam roller. My go-to primers are Bulls Eye 123 Primer or Slick Stick. For wood that causes bleed through or pieces with stains, my go-to stain blocking primers are Bulls Eye 123 Primer Plus or clear BOSS, especially if you will be painting a light color like white. You may need to apply two coats. If a pinkish hue appears after the first coat of paint, apply another coat of primer in those areas. Both of these stain blocking primers also help to remove odors. Note: You'll notice the photos included in this post is of a previously painted piece. I knew it was safe to sand because I was the one who painted it many years ago with latex paint. Wrap 150-grit sandpaper around a sanding pad and rough up the surface to give the paint some bite. 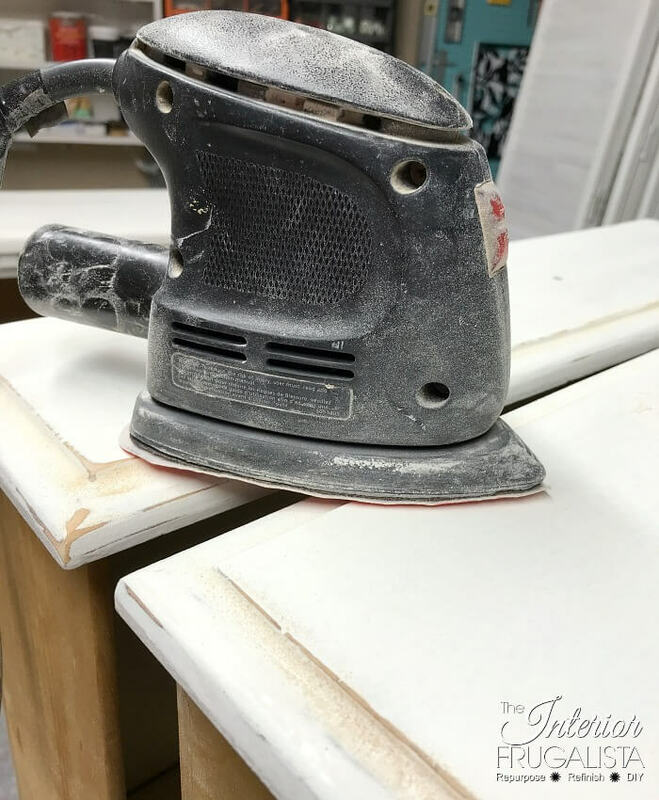 You may need to bring out the big guns and sand with either an orbital sander, palm sander, or mouse sander. My preference is a mouse sander because I like how it feels in my hands, it can easily get into tight corners, and I feel like I have more control. However, if it's a rather large piece, I'll use an orbital or palm sander. You can see in the photo above that my mouse sander is well used and a bit of a relic. Time to consider replacing it. Wipe the furniture with a damp cloth to remove sanding dust. 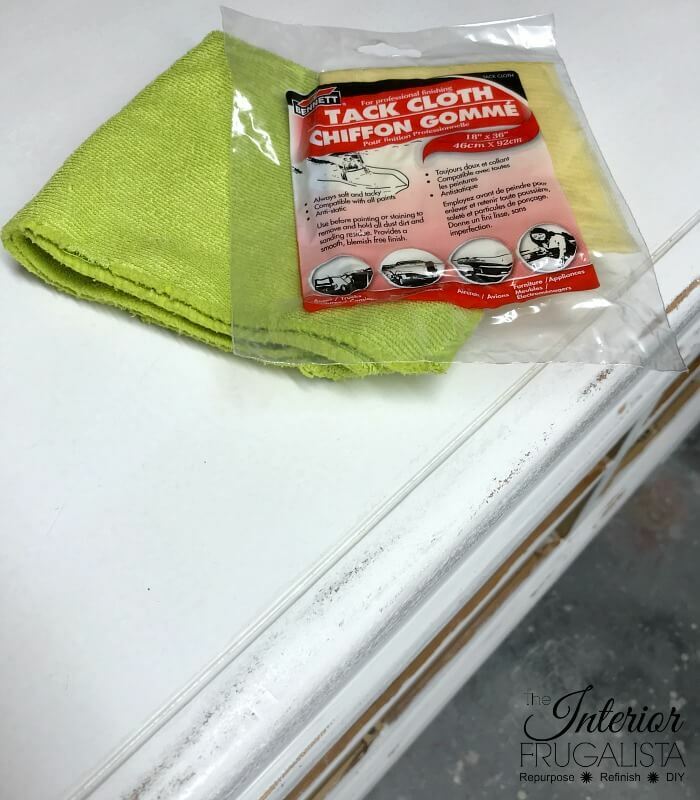 Remove lingering fine dust particles with a tack cloth. 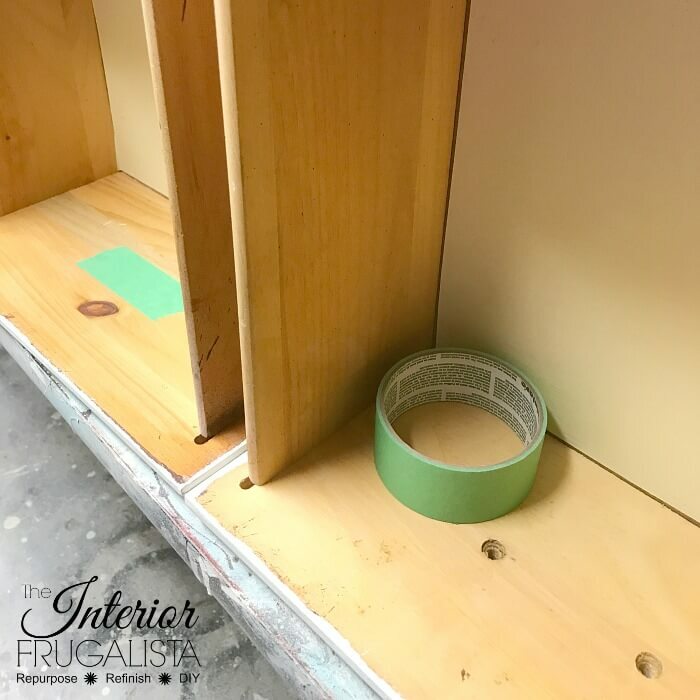 Place tape over the hardware holes on the inside of the drawers to avoid paint seeping through and clogging the hole or worse, seeping into the inside of the drawer. Now you're ready for the fun part, paint! 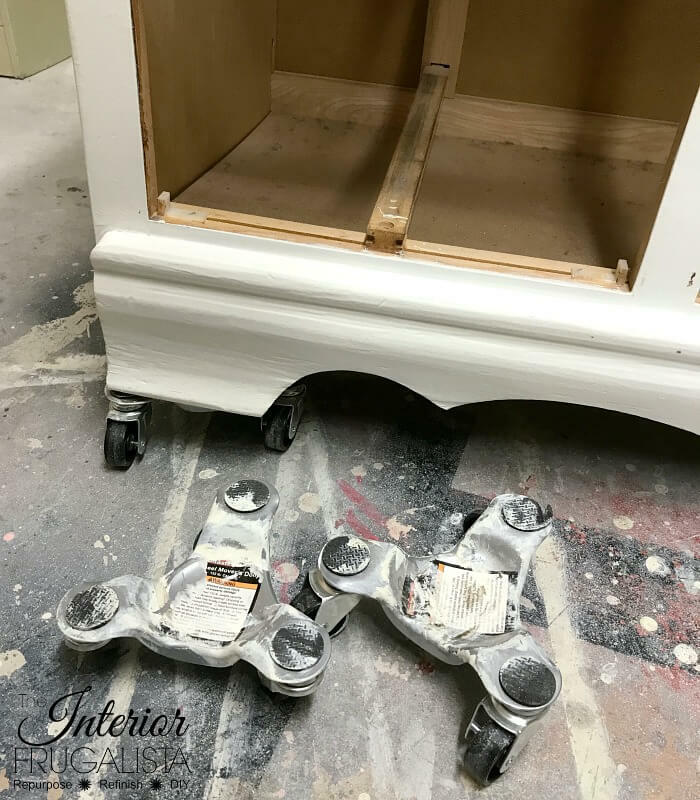 Should you decide to heed the chalk paint brand's claim that their paint does not require sanding, here is a tip to test whether it bonded well with your furniture. Do the fingernail test after 24-hours. 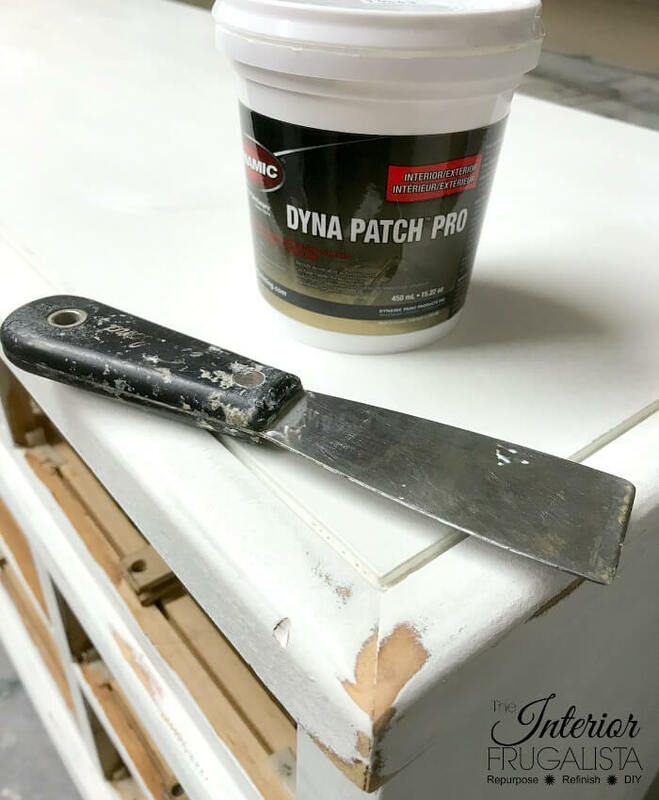 Scratch the paint with your fingernail and if it comes off, then you need to do more prep. 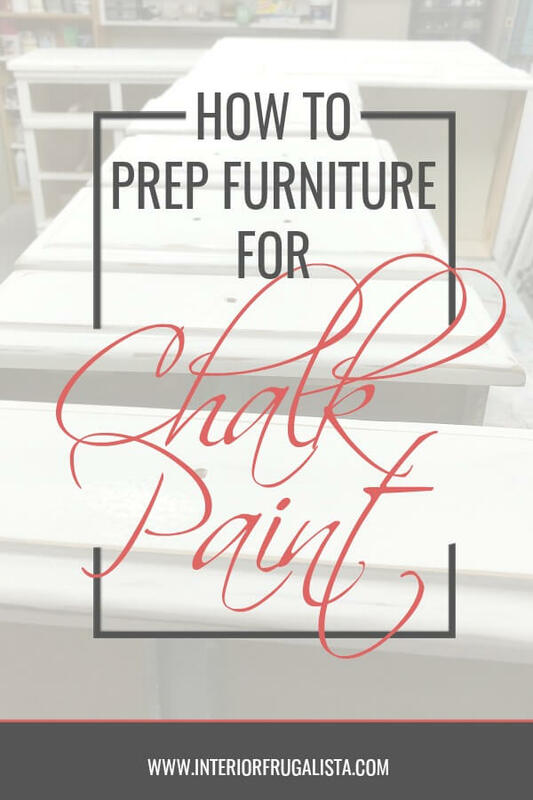 If you have any questions about prepping furniture for chalk paint, please feel free to leave them either in the comment section below or press the Contact Me button at the top of the blog to send me an email. Visit my tutorial page for more helpful tips.